Shadow, and I had two Adventures to Kennebunkport, Maine in the summer of 2017, and I believe my Mom joined us on one of those trips. Kennebunkport, Maine is a coastal town in Southern, Maine. It is well known for the beaches, the Bush Compound, a Trolley Museum, and the Goat Island Lighthouse. We have had wonderful trips to Kennebunkport, Maine, with my beach-loving Shadow. 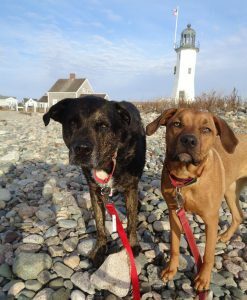 We were especially drawn to Kennebunkport as it was a short drive from our home state of Massachusetts, a dog-friendly town, and provided us a lovely coastal experience. One of our highlights has been running around on the beaches, often meeting other dog lovers, and enjoying the gorgeous setting sun. On one of our journeys I took a little video of a jog on the beach that really captured a special memory with my Shadow, (which you can view below). And although I sound a bit comical I somehow just love this silly little video. In addition to the beaches we have enjoyed the little downtown area, including: the tasty Clam Shack,a lovely bridge adorned with beautiful flower boxes, and little shops along the way. We also spent some time trying to capture the Goat Island Lighthouse on camera, although only viewed from afar. It was hard to track down photographs from our visits, but I think I was able to gather a good collection highlighting some wonderful moments in Kennebunkport. Definitely a special New England town which we plan to return to again (Rating: 4).